I have several 1940s--1950s planes to finish in natural metal. I know the Alclad paint has been explained in other posts, but what should be done for plastic prep? Specifically what sanding needs are there? What grits should I use, etc?? Use whatever grits you need to give you a glass-smooth finish. Different plastics will respond to different grits, but as a general rule, start with larger grits and work down to the really small. You'll probably want to wet sand. Practise on a test model first until you get the hang of polishing without going through the paint. In each case you must be sure that the surface is as perfect as possible. Alclad tends to magnify any irregularity. Tamiya has a very good set of sanding tissues ranging from 800 grid up to 3600 (the finest). before alclad, you must prime your model. For metal coatings this is usually gloss black but careful, for some finishes alclad recommends grey. You can also vary the "blackness" of the primed surface by adding a tiny bit of gloss white to the primer only for one or two panels of the plane; This allows for getting a different final finish and slightly color shade without having to work with several alclad airbrushing sessions, and the possibility to ruin the previous layer while masking for the second one. Even before polishing, you need to carefully seal any putty work so that the surface is constant in texture and porosity with the rest of the model. I now seal Green Stuff with CA glue, then sand it. A final coating of Tamiya gray primer, or Mr. Hobby 1,000 primer sealer will fill any small spots I missed. Then I start the polishing process going from a #4,000 grit to a 12,000 grit pad. While an undercoat of black always seems to give added lustre with any metallic "silver" paints, I've got to admit I don't always use a primer coat before Alclad II and I've never had any problems. I think there's something of an urban myth evolved that it's somehow "difficult" to use, but I concur with the need for preparing as smooth as surface as possible. A final going-over with a nail buffer does no harm. Only thing I'm going to add here is you MUST let the base coat FULLY dry before spraying the Alclad . If not - cracks will develop on the finish over time ( ask me how I know )ruining the model . In short terms you don't need a base coat . Aftr the prep has been done a few coats of future and once this has FULLY dried it can be polished and Alclad spray on . The future will give bite to the surface . All of the methods describe form the others will work just fine and give you excellent results , you just have to find which works best for you . 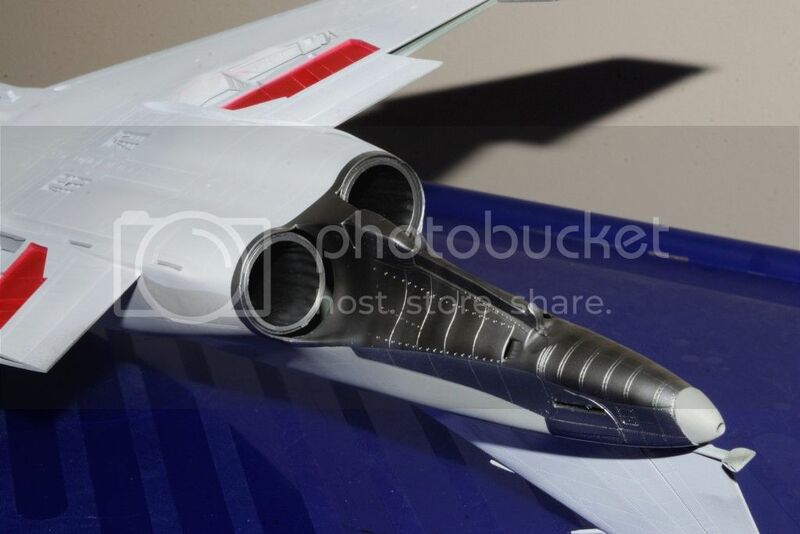 Thursday I shot the exhaust area of the F4B with Alcads. I did several Google searches plus went back to Alcad's home page and re-read their instructions. The plastic needs to be blemish free. No glue stains, no putty porosity, etc., as it will show right through the Alcad Metallics. The smoother the surface, the smoother and shinier the finish will be. Like I said before, I seal Green stuff with CA glue, then sand and polish. Rowan's point with a nail polisher will really give you a shine, and many modelers use them. As for a base coat, all Metalizers need a Gloss Black base which is what actually reflects the Metallic finish. A gray or no base just ends up looking like regular flat Aluminum paint. It's that important. And yes, the base coat must be completely dry. Alcad has a gloss black lacquer based paint which I used. Recommended drying time is 24 hrs. I gave it a little more. BTW, it was dry to the touch in less then a half hour. I just had to check. Air brushing their Gloss Black is done at 15-20 psi. I shot it @ 15 psi. Came out smooth as silk. I shot all the Alcads at a max of 10 psi. If your prep work is done right, Alcads is even easier to airbrush the acrylics. As for a base coat, all Metalizers need a Gloss Black base which is what actually reflects the Metallic finish. A gray or no base just ends up looking like regular flat Aluminum paint. Unless, of course that's the look you're after. Different colours in the base coat will give you an interesting patchwork effect, which is very often seen on bare metal aircraft. I would dispute that, but it's getting into minutiae and life's too short. The use of Black gloss is part of the regular process. Using different color bases decreases the metalizer effect, it doesn't eliminate it. If there is a different effect one is after, then by all means go for it. My statement was for the basic procedure that is recommended by Alcad. Jessica, It's really hard to vary the tone of metalizer by panels or area that way. It's much easier to just mask off and airbrush any color or mix one may want. Here's a picture of my F4B exhaust that I also posted in my build blog. All the various panels started with a Gloss Black Base color. Thanks all for the abundance of insight on the Alclad! I will experiment with these. I was a little intimidated with this stuff after reading articles on it. I wonder if a very dark blue primer would work as well. Maybe seem more like the sky as an undertone. Will definitely polish, polish, polish!!! To tell the truth, I found it easier to airbrush the Alcads then most acrylic paints. Reason being is that they're already pre-thinned and shoot at a very low psi. Sealing putty, and polishing prep work is the key to a perfect finish for all types of paint, not just Metalizers. Dark gloss blue will give you a different tone then gloss black. Just keep in mind that there is already a huge number of different shades, and you can mix and match as well. At the beginning of your metalizer journey, create a set of standards for yourself, once you can duplicate your procedure time and time again, then you can experiment to your hearts content. I use Tamiya acrylic black in gloss or semi-gloss as a primer for my Alclad and never have any problems. You can vary the coverage when applying the Alclad after that to give any level of weathering to the finish. I have masked over the Alclad many times to paint anti-glare panels etc and never had the paint lift with the masking tape. This thread shows that the techniques for Alclad preparation and application and many and varied, just try a few and see what works for you! To my surprise, I also found out that you can mask right over Alcads without pulling any of it up. I use de-tacked Tamiya tape. I was prepared to seal between every color application which is a very time consuming process. Now I can do all my panel work in a session or two. Actually a gloss black undercoat is recommended for use under chrome only; although it does no harm using it for other Alclad II shades and you can get a pleasing shadow effect in some areas. Mal, on their site the recommend gloss black for all shiny metallic finishes. Any color primer for flat finishes. I just use Gloss Black for everything, as it makes the prep work that much easier, and the surface has a deeper shine to it. They do recommend a smooth base surface, so using a regular primer will require more prep work then to get it smooth enough for the Alcad 11 Metalizers. Errr yes it has, when Alclad II first came out a gloss black primer was only recommended for a chrome finish, but many modellers took it to be the norm for all Alclad shades. Actually the chart you show shows that they don't recommend gloss black for everything? Like I said, I just standardized on gloss black because it's easier for me to do so. 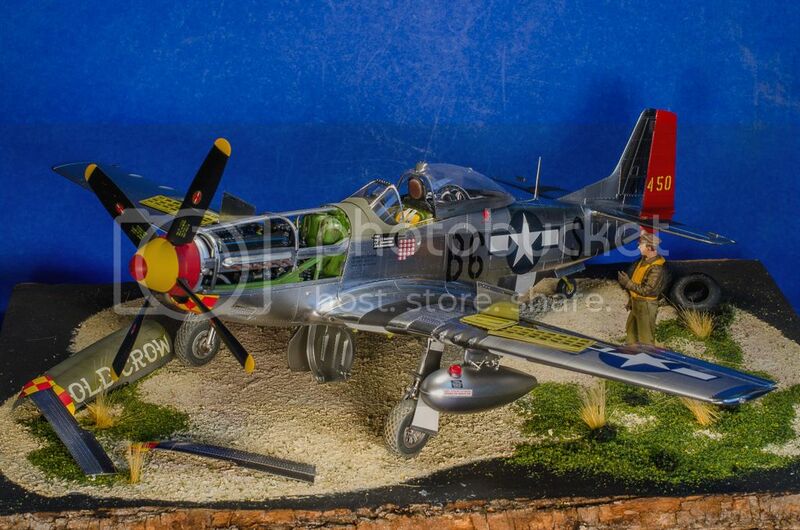 I'm thinking of using Tamiya's Gray primer as the base for my P-38 NMF as I want to do a PTO operational aircraft. I've also noticed that not polishing the gloss black primer as recommended, gives you a less "deep" shine, and a more weather worn finish, which is what I usually aim for. Now my brother is just the opposite with his 1/32 scale P51-Ds. His finishes are all museum polished quality. One needs a pair of sunglasses to view his models. yes it has, when Alclad II first came out a gloss black primer was only recommended for a chrome finish, but many modellers took it to be the norm for all Alclad shades. Actually the chart you show shows that they don't recommend gloss black for everything? That's my point. I use Halfords grey plastic primer under anything except highly polished finishes. It works fine. Not to drift too far off topic, but as far as primers go, I've tried quite a few. I truly disliked all the acrylic primers especially Model Masters, which as far as I'm concerned is the worst of the lot. Didn't stick that well to the plastic, and neither did the Model Master acrylic paints stick particularly well to it. I found that the Tamiya lacquer based primers to be the best all around primer for me, since it comes both in a bottle and a rattle can. Just that the smell at times is an issue. Allcad's black primer is an enamel, and is the equal to Tamiya's primer. I actually prefer it as it helps with color modulation & toning down brighter colors. I really don't like using white primer as the colors are just too bright for a scale effect. It looks like we ended up in the minutiae I did my best to avoid (remembering this is a beginners thread). For the record, if I use a primer for metallics, I normally use black like Joel for simplicity's sake. White is great as a primer for yellow (and maybe dayglo colours? - I've never used them), but I wouldn't normally bother with it. Perhaps I can dispel this "urban myth" myth; I worked (although that's a bit subjective, since he did all the legwork) with the inventor of Alclad II, and (at the time) we found that some plastic (and Revell Germany was particularly prone) could be damaged by the paint. We found that plastic in which "swirls" could be seen was particularly sensitive, and worked out that air seemed to be introduced into the (possibly recycled) plastic during injection. Being below the surface, the air was not touched by "ordinary" paint solvents, but the extra-lively Alclad solvent appeared to break through, at times, causing the air bubbles to erupt like a miniature Vesuvius. To insure against this, a primer was recommended, and (again at the time) Halfords' Plastic Primer (grey or white) was found to be ideal. Since then, of course, the technology has moved on, Alclad is made in the U.S., as well as here, so local conditions will always apply; applying the tried-and-tested "belt and braces" method, primers are still recommended because of how history has a habit of repeating itself, and what's the price of a can of primer against a £50-£100 kit?